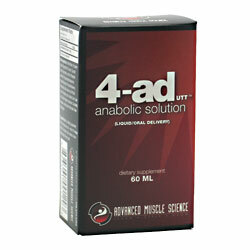 Details 4-AD UTT is a unique anabolic solution pro-hormone that converts at a high rate of testosterone. The liquid oral delivery system will give you better strength and size increases than the old testosterone precursors. Directions As a dietary supplement, take 2 oral doses per day, under the tongue, hold for 30 seconds, then swallow. Use in divided doses 8 hours apart. Warnings Not for use by individuals under the age of 21 years. Not for use by women. Keep out of reach of children. Consult a physician or licensed qualified health care professional before using this product if you have, or your family has a history of: prostate cancer, prostate enlargement, heart disease, low HDL cholesterol or if you are using any other dietary supplement, prescription drug or over-the-counter drug. Do not exceed recommended dosage. Exceeding recommended dosage may cause serious adverse health effects. Possible side effects include: acne, aggressiveness and irritability. Discontinue use and call a physician immediately if you experience rapid heartbeat, dizziness, blurred vision or other similar symptoms. Do not use if governed by any athletic or governing body that prohibits prohormone or anti-estrogen supplements. To report any adverse event, call 775.577.5358. Nutrition Facts Serving Size 1 mL Servings Per Container 60 Amount Per Serving Serving % DV 4-Androstene-3b-ol, 17-one 40 mg - *percent Daily Values are based on a 2,000 calorie diet. Ingredients: Purified Water, Propylene Glycol, Polysorbate 80, Glycerin, Caprylic/capric Triglycerides, Lecithin (Phosphatidylcholine, Phosphatidylethanolamine, Phosphatidylinositol, Phosphatidylserine, Phosphatidic Acid), Natural and Artificial Flavors, Phosphoric Acid, Xanthan Gum, Guar Gum, Sodium Alginate, Aspartame, Sucralose, Potassium Sorbate Sodium Benzoate, Foam Control Agent. *These statements have not been evaluated by the Food and Drug Administration. This product is not intended to diagnose, treat, cure or prevent any disease.